[Reposted from 3-24-2010] On Tuesday April 4th, in the USA we observed Ram Navami, or Lord Rama's holy appearance day anniversary. Although Lord Chaitanya is the combined form or Radha and Krishna, coming to give Krishna prema for the fallen souls of Kali-yuga, he also contains all other incarnations of God within him, including Lord Rama. Therefore, Lord Chaitanya is Universal. Anyone desiring to make spiritual advancement and increase their devotion toward any real incarnation of God can obtain that goal by taking shelter of him—he is so merciful and accessible. Devotees of Shri Rama can see Chaitanya Mahaprabhu as the manifestation of Lord Rama for this age. Shri Chaitanya showed a six armed form to his devotees to demonstrate that he was also Lord Krishna and Lord Rama. 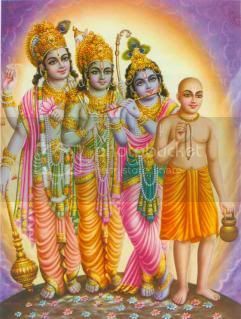 At least two principles devotees of Shri Chaitanya were also devotees of Lord Rama. One of them is none other than Hanumanji, who in Chaitanya lila, is the Kaviraja (Ayur-vedic doctor) and great devotee, Murari Gupta. It is said that Murari Gupta cured people’s material and spiritual diseases. He was also one of Lord Chaitanya’s principle biographers. 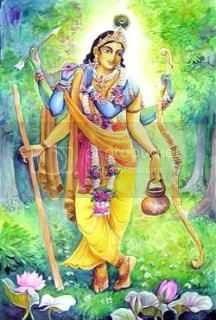 The stanch devotion to Lord Rama of these two devotees was tested in a similar way by Lord Chaitanya, and then he greatly praised their Rama Bhakti or devotion to Shri Rama. “Sri Caitanya Mahaprabhu then embraced Murari Gupta and began to speak about his firm faith in devotional service. This was heard by all the devotees. "I then requested Murari Gupta, ‘Worship Krsna and take shelter of Him. But for His service, nothing appeals to the mind.' In this way, he heard from Me again and again. By My influence, his mind was a little converted. 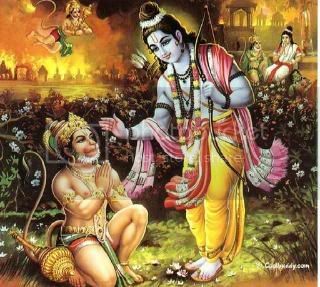 "In this way, I congratulated Murari Gupta, saying, ‘Indeed, you are the incarnation of Hanuman. Consequently you are the eternal servant of Lord Ramacandra. Why should you give up the worship of Lord Ramacandra and His lotus feet?' Sri Caitanya Mahaprabhu continued, "I accept this Murari Gupta as My life and soul. When I hear of his humility, it perturbs My very life." “'My dear Lord, we are living in the forest. For the time being we cannot get all the ingredients for cooking. "When Laksmana brings all the vegetables, fruits and roots from the forest, Sita will do the necessary cooking.'" 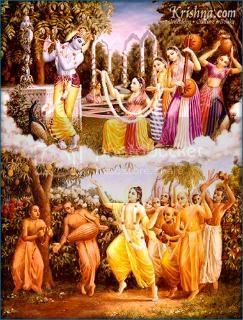 “Sri Caitanya Mahaprabhu was very satisfied to hear about the brahmana's method of worship. Finally the brahmana hastily made arrangements for cooking. Sri Caitanya Mahaprabhu took His lunch at about three o'clock, but the brahmana, being very sorrowful, fasted. While the brahmana was fasting, Sri Caitanya Mahaprabhu asked him, ‘Why are you fasting? Why are you so unhappy? Why are you so worried?’"
"When he was petitioned by mother Sita, the fire-god, Agni, brought forth an illusory form of Sita, and Ravana, who had ten heads, kidnapped the false Sita. The original Sita then went to the abode of the fire-god. When Lord Ramacandra tested the body of Sita, it was the false, illusory Sita that entered the fire. At that time the fire-god brought the original Sita from his abode and delivered her to Lord Ramacandra." Then the brahmana again invited Shri Chaitanya for lunch apologizing for the last time in which he was late. Then Shri Chaitanya traveled on. The point of narrating these stories today (on Ram-navami or Shri Rama's appearance day) from the life of Shri Chaitanya rather then from Ramayana, is that Lord Chaitanya is also Lord Rama. God is one, yet he has different features which correspond to the love of his devotees. We all have a unique relationship with a particular form of God, and that will be revealed through our spiritual practices (sadhana). By worship of Shri Chaitanya Mahaprabhu we can all become perfect in our quest toward perfection and worship of God. We can all join together in sankirtana or group chanting of the Hare Krishna mantra which also contains the name of Lord Rama. Submitted by Karnamrita on Fri, 2010-11-19 10:16.